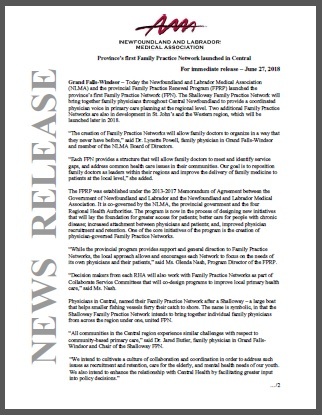 Today the Newfoundland and Labrador Medical Association (NLMA) and the provincial Family Practice Renewal Program (FPRP) launched the province’s first Family Practice Network (FPN). The Shalloway Family Practice Network will bring together family physicians throughout Central Newfoundland to provide a coordinated physician voice in primary care planning at the regional level. Two additional Family Practice Networks are also in development in St. John’s and the Western region, which will be launched later in 2018.